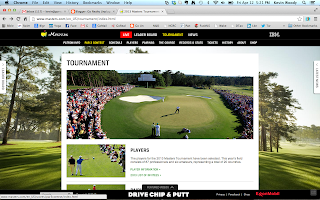 The Masters Golf Tournament is the big sporting event as we move into this weekend. As a sports fan, I have listened to a lot of chatter about it on talk radio, watched previews and predictions, and we even had it on the big screen at Go Cary Thursday and Friday. If you're not into golf, it's difficult to appreciate all the hubbub, but there are some lessons to apply to our business. I heard an interesting comment from David Feherty, a former player at the Masters, and now an analyst for the coverage provided by CBS. Known for outrageous comments and quick wit, Feherty said that "walking onto the grounds at Augusta National Country Club is like walking into a Salvador Dali painting. I keep looking for dripping clocks. It's so perfect, it's surreal." Likewise the professionals who play the game each week at the world's best kept golf courses describe the event, the experience, and the course with words that we often associate with religious reverence. Listening to radio comments today, I heard a phrase that got me thinking: "Consider their commitment to perfection." While the course, event, and members of the club are not perfect (clearly take a look at their slow response to racial and gender issues related to their membership), they are successful zealots for creating a course that is unique in stature, an experience for their clients (the world's greatest golfers) and a product for their consumers (millions watching in person and on broadcast with limited commercials) that is unmatched in any other tournament. Every other professional tournament in the PGA offers extreme prizes, national recognition, and the draw of the world's best players. But ask any pro what one tournament he would most want to win, and the answer will be, "The Masters." Augusta National Country Club has the premier product. As we consider our work at Go, what's our commitment to perfection? Are we zealous to create an experience that is unmatched by any other agency, by any outside agent? Are we innovative in delivering our product in ways that others do not? Would our clients acknowledge that we deliver value and they don't consider cost because our level of performance is so great? Is what we do beautiful? Whether you're passionate about golf or not, I encourage you to watch a bit this weekend. Note how the broadcast is different, the tension of the players, the energy of the spectator galleries, and how the whole event is presented on TV and on the web. Look for the details: the white attire of the caddies, the way the leader boards are posted, the minimalist approach to camera stands and commercials, and the absolute glory of that course at the peak of spring time bloom. I hope it inspires you. And let's keep stoking our own passion for perfection.